Mary Free Bed Rehabilitation Hospital becomes the first hospital in the Midwest to acquire a ZeroG Version 2. This new technology aids patients in gait and balance activities while they still have the safety of being protected by falls. Patient Todd VanZantwick used ZeroG to jog half a dozen paces down the hallway three weeks after he began his physical therapy. VanZantwick was among the first patients to benefit from ZeroG, Mary Free Bed’s new and sophisticated gait and balance training system. It gave VanZantwick the confidence to push himself harder because he knew he wouldn’t fall. “There’s no way we could have attempted that without this equipment,” Mary Free Bed physical therapy Kristy Simpson said of VanZantwick’s brief run. “Now, we can be more aggressive, because the risk of fall is almost eliminated. And the more aggressive we can be, the more function the patient will recover. ZeroG is a machine that runs along 85 feet of ceiling-mounted track on the fourth floor of Mary Free Bed’s new hospital in Grand Rapids. ZeroG provides “dynamic” support. Once a patient is trapped into the harness, a therapist can program the machine to provide a certain amount of constant physical support and to “catch” the patient if he or she ventures out of the designated parameters. ZeroG gave VanZantwick the support and leeway to jump and move from side to side, but once he strayed too far or moved too quickly, signaling the machine he might be falling, the ZeroG Harness strap would lock to prevent him from taking a tumble. Patient Terry Carter is rehabilitating from a spinal cord injury and broken hip. ZeroG provided support as he attempted to step up onto a stool. He also worked on standing from a seated position – without fear he would tumble forward onto the floor. Carter even enjoyed a game of Tetris on ZeroG’s touchscreen by working to control and stack the blocks by jumping or moving his body from left to right. “If we have to concentrate on keeping a patient from falling, it’s difficult to also focus on the muscles they’re using and how to best help them improve their walking skills”, Simpson said. It was more a dream than anything. Joel Jackson had not been expected to survive the 2009 car wreck that separated his spine from his head, let alone get out of a wheelchair. But that wish came true. A couple weeks ago, Lauren and Joel, both 26, shared an impromptu moment swaying to their wedding song, Edwin McCain’s “I’ll Be,” at a rehabilitation hospital in Jacksonville, Florida. Joel, suspended from the ZeroG Gait and Balance System, looked into his wife’s eyes — the only way he can communicate with her. She looked up at him. “My goodness, you’re so tall,” she said. Lauren kissed Joel. Their eyes met. They danced. Everyone else in the Brooks Rehabilitation therapy room stopped what they were doing to watch the young couple, who have known each other since childhood but reconnected after his accident. Several wept. “Euphoric,” recalled Joel, who spoke to NBC News with the help of a computer. Before wrapping her arms around her husband, Lauren handed her phone to an intern at the rehab center, who recorded them. She posted the video on her blog, where she documents their journey. “The little things mean so much to us,” Lauren said. Lauren and Joel have known each other since they were 14. They met during a church event in Anderson County, South Carolina. There was an immediate spark, and they became close. But they gradually drifted apart.In December 2009, Joel and five other young people got into a car with a drunk driver, who hit a telephone pole. A 15-year-old girl died, and Joel, 20 then, was thrown from the car. The impact shattered his spine where it connects to his skull — an “internal decapitation” that few people survive. At the time, Lauren had not seen Joel since high school graduation. She went to visit him. His jaw had been broken in the wreck and hadn’t been repaired, so he could not speak — a condition that never improved. In late 2012, they began dating — movies, mostly. He proposed a few months later through a video that friends helped produce. They were married in September 2013, Joel mouthing “I do.” At the reception, Joel’s father lifted Lauren onto Joel’s lap as “I’ll Be” played. “But I told him, ‘When you can talk, I want to renew our vows. And when you can walk, I want you to dance with me,'” Lauren said. She put her career on hold to care for him. They developed an intricate but efficient method of communicating, in which Lauren moves through the alphabet and Joel signals with his eyes the letters he wants to use. Joel also took up painting by holding the brushes in his mouth; he sells his work online. Lauren tried to find Joel rehabilitative services. His spinal injury was “incomplete,” meaning that he could feel things and had a bit of movement. But no one they saw had worked with a patient with a C1 injury. They were turned down everywhere they went. “He believed there was nothing else that could be done for him,” Lauren said. Frustrated, they moved to Florida with Joel’s father, who works for Lowe’s and put him on his insurance plan. Joel also receives coverage under Medicaid and Medicare. Lauren began the search all over again. A neurologist referred them to Brooks Rehabilitation. It took months for Joel to trust the physical therapists, who wanted to put him on a regimen to strengthen his body and circulatory system. They also wanted to figure out why Joel still could not speak. “As someone who’d never had any physical therapy, we don’t have any idea of what his potential is, what he is hiding,” McIver said. 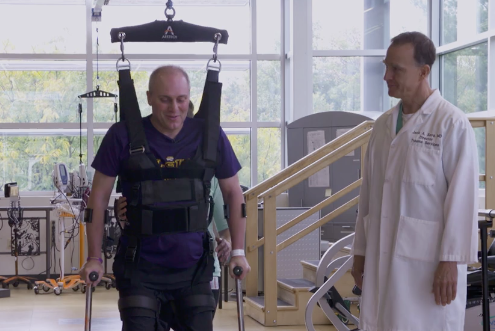 On Oct. 1, Joel’s therapists asked if they could put him in the device called ZeroG that allows patients to stand upright while allowing their legs to support a small amount of their body weight. Joel, using his eyes, signaled that he agreed. Lauren, who typically records all of Joel’s rehab regimens, looked away to read a text message. When she turned back, Joel was up. She thought of her wish. “Hey, Joel, do you want to dance?” she said. McIver found a recording of “I’ll Be” and piped it into the gym’s speakers. Joel met her gaze to tell her he was ready. They moved together, Lauren holding him and smiling, Joel looking at her intently. After being told for years not to expect a life beyond a wheelchair, there was hope. Joel has continued to regain strength and body movement, McIver said. “That little step that got him something he wanted, and he looks at what’s the next thing he can do,” he said. Joel’s gains have motivated the couple to try to buy a home and develop an event planning business. They’ve appealed to supporters to donate to their “home fund,” offering Joel’s paintings as gifts. “For two years we’ve lived without an income, so we have to get creative,” Lauren said. Sue Golden, PT, NCS Director of Neurorehabilitation Technologies at Good Shepherd Rehabilitation Network in Allentown, PA is interviewed by Advance magazine on the immediate impact ZeroG made to their therapy program. “We see patients here with stroke, spinal cord injury, head injury, vestibular issues, concussion, multiple sclerosis, cancer, Parkinson’s, movement disorders, really anything neurologic, as well as amputations,” said Golden. The facility implemented the ZeroG Gait and Balance Training System in December and saw immediate positive results. Pediatric patients recovering from a spinal cord injury, brain injury or stroke at Children’s Specialized Hospital now have access to ZeroG, cutting edge balance and gait training system that helps patients to walk again. Here at Children’s Specialized Hospital, we include ZeroG in our intensive pediatric rehabilitation hospital program, making us one of only two children’s hospitals in the country to offer the device. The ZeroG is our newest addition to our therapy program, but our highly skilled team utilizes many other treatments for children with spinal cord dysfunction, stroke and brain injury. Our outcomes and recovery rate for our brain injury, spinal cord and stroke patients far surpass the national average of similar institutions. According to 2013 pediatric functional independence measure (WeeFIM). Stroke: average change rate score of 58.1% vs 34.9%. Patients can begin physical therapy earlier in their treatment, a factor associated with enhanced outcomes. The body-weight device allows for partial compensation of spasticity, abnormal coordination, and weakness. There is nothing on the floor, so patients can practice on stairs and uneven ground, train for sit-to-stand motions, and use assistive devices if necessary. The device offers security, so patients may not develop compensatory strategies. Therapists can assess and track a patient’s recovery. Each patient’s treatment plan combines a vigorous rehabilitation program with comprehensive medical and nursing care. Of course, we understand that dealing with a spinal cord injury can be a stressful ordeal, even with the best care. So, to help our patients adjust as they recover from their injury, the team also provides community integration trips, school visits, and home evaluations to ensure a smooth transition to home and school. Baton Rouge Rehab Hospital is using the ZeroG Gait and Balance Training System to revolutionize rehab for amputees. Jeremiah Foster was born with underdeveloped arms and legs. As he grew, his legs had trouble supporting him. Then he found out he had arthritis in his legs. At age 13, Jeremiah decided to have his legs amputated so he could walk again. He struggled with rehab for years. Now at 18, Jeremiah can walk with confidence, on his new legs. He says it happened after getting to use the ZeroG system. It’s the only one in Louisiana. “I’ve only been three feet tall my whole life so this since September is really a jump for me so not only that the height but also I don’t have any arms to catch me if I fall so there’s nothing really to protect me or anything like that I just hit the ground so with the harness that really helps out a lot,” said Foster. Foster says ZeroG takes away the fear, allowing him to strengthen his legs, and learn to walk. “I don’t have to worry about it anymore. I can go places, if someone wants me to go with them grocery shopping, or shopping for clothes, or anything, I can wear jeans now, I couldn’t before,” Foster explained.